For third year, Lancaster County is hosting the American Quilter’s Society Quilt Show & Contest, March 14-17! While many of the show attendees choose to stay downtown, the best way to really experience the charm of PA Dutch Country is by staying at a bed and breakfast like the Historic Smithton Inn, just 12 miles from downtown. One of the charming features of this c1763 B&B are the hand sewn quilts on the beds in each guest room… you just can’t get THAT at a chain hotel! In addition to enjoying your visit to our area, known for its hand-crafted Amish and Mennonite quilts, we can point you to fantastic restaurants, quilt and fabric shops, museums, theaters and more! The AQS show will be held at the Lancaster County Convention Center, in historic downtown Lancaster. 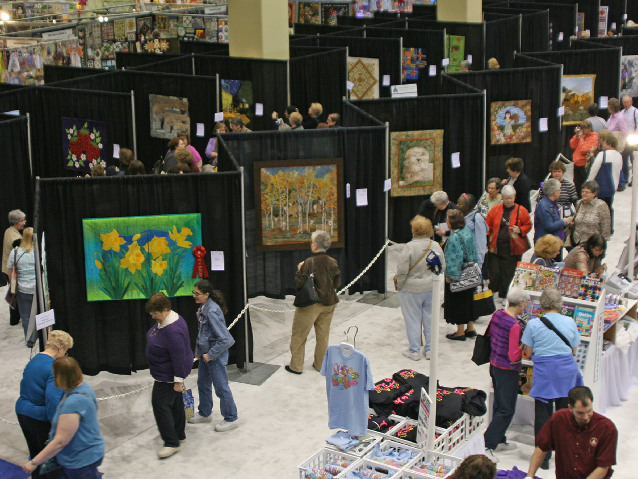 The quilt exhibits and merchant mall areas will be located in Freedom Hall, the Commonwealth Ballroom, and the Heritage Ballroom – all located at the convention center. Quilters from around the world will be displaying their finest work in this international quilting event. More than $44,000 in cash prizes will be awarded in the quilt contest, with $10,000 going to the Best of Show winner. Workshops and lectures will be held in the convention center, across the street in Southern Market Center, or two blocks over at the Millersville University – Lancaster venue. The show will also feature numerous special events and exhibits. So if you’re looking for a unique way to experience Lancaster County AND the AQS Quilt Show, book your room at the Historic Smithton Inn today.